At rare times certain designers can be considered dominant in their genre. Think Doug Peterson in the early IOR days and Bruce Farr in later IOR days. This dominance seldom went outside that genre. You could argue that in Bruce Farr’s case. But when it comes to trailerable, folding trimarans for the past 25 years, maybe longer, Ian Farrier has totally dominated the scene. You think folding tri and you think Ian Farrier. It’s automatic. This has given Ian many years to slowly evolve a near-perfect product. I say “near perfect” because I’m sure Ian has more tricks to come and I don’t want to sound like I’m limiting his creativity. Are these good boats? Numbers don’t lie, not in this case. If that’s not enough for you I have sailed my buddy’s turbo F-27 several times and I can assure you that it is a most enjoyable and at times exciting ride. If you want to sail flat and fast you can’t beat one of Ian’s trimarans. 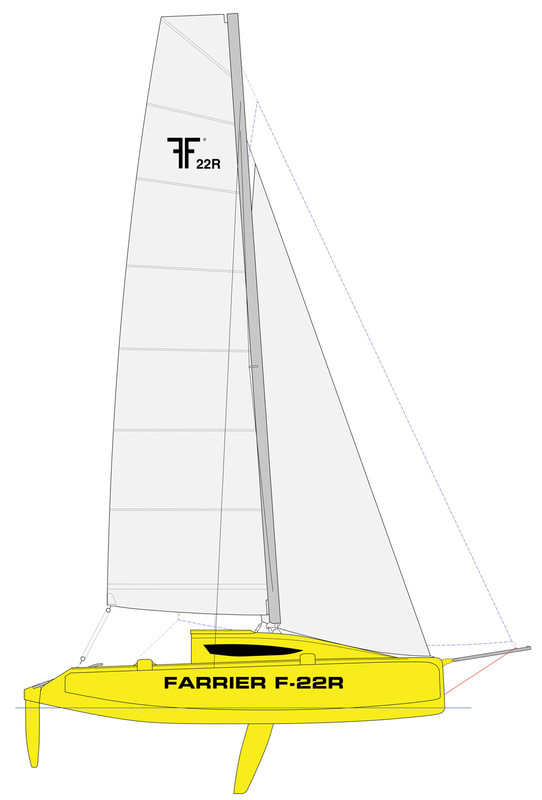 Ian’s newest folding trimaran is the F-22, available in three versions: Standard, Premium and Race models. The D/L is 125. There is a single, deep centerboard with a board-down draft of 4 feet 11 inches. The cassette-style rudder make beaching and trailering a breeze. Board- and rudder-up draft is 12 inches. Max beam is 18 feet 1 inch. Note the flat profile to the hull through the middle then it kicks up around station 8. The main hull has that typical inverted bell shape that provides volume where you need it for accommodations and a narrow BWL for speed. There is a very clever galley module that disappears into the seatback area when not being used. This would be camping-style cruising in the F-22 but it would make a great singlehander. Construction uses the infusion method to insure light weight and strength. Resin is vinylester and epoxy. Carbon fiber is used in high-load areas and the hull is reinforced with kevlar, both sides of the core, for durability. The centerboard on the race model is carbon. I’m pretty certain that it won’t be long before this class takes off. I would very much like a ride.